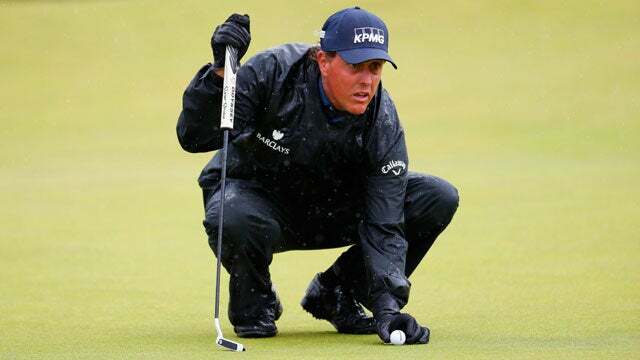 Phil Mickelson battled the weather to a second-round 69 at Royal Troon on Friday. 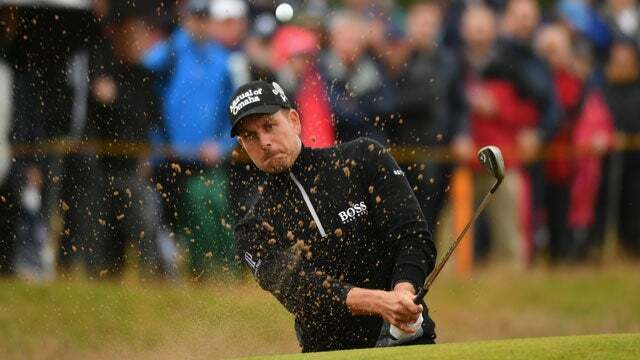 TROON, SCOTLAND — Phil Mickelson shot a soggy 69 this morning to retain a one-shot lead over a charging Henrik Stenson in the Open Championship at Royal Troon. Afterwards, Mickelson repeatedly described his round as "stress-free." Really? Mother Nature distributed stress in all its myriad forms on Friday. There was wind, there was rain. There was wind and rain. The morning was cold, turning cool and clammy. Two-time Open champ Ernie Els, finding his baseball cap to be a dripping distraction, played a few holes bareheaded and lacked only a lather of shampoo to complete the picture. "The ball was sliding and skidding on the greens," said Charl Schwartzel, who nonetheless managed to shoot a five-under 66 for a share of sixth place. "Pretty much every hole on the back nine there was wind straight off the left," said Mark Leishman, the Australian pro. "That's a tough wind for a right-hander." 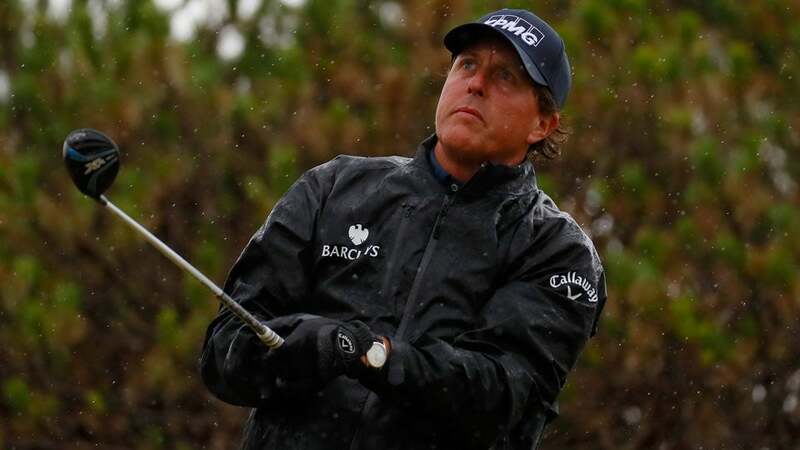 But Mickelson, who plays left-handed -- and coming off a major-tournament-record-tying 63 on Thursday -- acted as if the nickel-plated binder clip securing his cap against the wind was a mere fashion statement. "First of all, I really enjoy the challenge that this weather and these elements provide," he said, sounding as if he were keen to traipse over to the Troon Links muni for an additional practice round. If there was a second-of-all, I missed it. My mind was occupied by the memory of the 1998 Open at Royal Birkdale, where Mickelson shot himself out of contention with a third-round 85 in numbing chill and horizontal rain. "When you get to be 9, 10 or 11 over for the round," a dazed Phil said that day, "it's tough to grind out that extra par." Young Phil, I hasten to add, was not so wise in the ways of links golf. He hit the ball high and long and dared the wind to do its stuff. The wind, more often than not, complied. In his first ten Open starts, Mickelson finished no better than T11. Anybody who knew anything about golf knew he would never win an Open Championship. That was true until 2004, when Mickelson turned up at Royal Troon, of all places, with a different skill-set and a different attitude. "This is where it really kind of turned for me," Mickelson said today, reminding us of his third-place finish, a stroke behind playoff-bound Todd Hamilton and Ernie Els. "This is where I stopped trying to overpower the golf course, where I kind of accepted playing it as it's designed." Specifically, Mickelson throttled back on his clubhead speeds and started hitting the low-spin, low-trajectory "flighted" shots that go predictable distances and hold the line in virtually any wind. Today, for example, he used an iron repeatedly off the tee, leaving his high-launch hybrid in the trunk. "That 2-iron … just kind of gets on the ground quickly," he said. "I feel like if I have to get one in the fairway, I've got a club and a shot that I can do it fairly easily and consistently." Low-balling has clearly paid off for Mickelson. He was runner-up with Dustin Johnson in the 2011 Open at Royal St. George's. Two years later, at Muirfield, Phil fashioned one of the best closing rounds in Open history and won the claret jug by three strokes over -- guess who? -- Henrik Stenson. Stenson, if you haven't heard, shot today's best score, a 65, in the same icky conditions that Mickelson pretends to savor. "I birdied 10 in those conditions," the 40-year-old Swede said after his round. "Then I was hanging on for dear life on 11 and 12, really. They were playing tough, and I got away with a couple of pars." Like Mickelson, Stenson took a few years to get the hang of links golf, but since 2008 he has recorded two T3s (Birkdale and St. Andrews) in addition to his runner-up finish at Muirfield. A 14-time winner on the PGA and European Tours, Stenson lacks only one item for Hall of Fame consideration -- a major title. "I'm not going to play these tournaments forever and ever," he said, "so I better start putting myself in position and giving myself chances if I want it to happen." He added, "Phil's not going to back down. He's not going to take his foot off the pedal. I'm looking forward to the challenge over the weekend." Speaking of the weekend, Soren Kjeldsen and 2011 PGA champion Keegan Bradley served notice of their intentions with rounds of 68, giving them a share of third, three shots behind. ("I like playing this kind of golf," Kjeldsen said, echoing Mickelson. "I like the battling mentality that you need to play.") Defending champion Zach Johnson lurks in fifth place at 5-under, while early first-round leader Patrick Reed drifted off the leaderboard with five bogeys in his second-round 74. The Big Four toiled in relative anonymity. Rory McIlroy, still smarting, no doubt, from the backlash to his disparaging Olympics remarks, shot 71 in afternoon winds that gusted to 30 mph, finishing at 2-under. Dustin Johnson, still glowing from his U.S. Open triumph at Oakmont, shot 69 to join McIlroy in 15th place. Jason Day, still No. 1 in the World Ranking after top-ten finishes in the U.S. Open and WGC-Bridgestone Invitational, shot 70, good for T41. But World No. 2 Jordan Spieth, still struggling to find fairways and hole putts with his usual aplomb, yanked the first two shots of his round -- iron shots! -- into the gallery. Carried in on a tide of poor afternoon scores, the young Texan shot 71-75 and made the cut on the number. Spieth's stressful finish came hours after Mickelson's "low-stress" comments. Speaking candidly, the 46-year-old pro had allowed that there was a secret behind his what-the-hell demeanor. "I don't feel the pressure like probably a lot of players do to win the claret jug," he said, "because I've already won it. I would love to add to it, but having already done that was big." He hesitated. "I lost my train of thought. What was the second thing?" The second thing, Phil, would be another Open title.